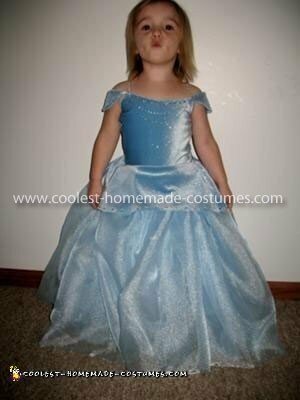 I created a Homemade Cinderella and Prince Charming Couple Costume. For Cinderella I started with a sewing pattern for a leotard. I altered the pattern to get a v neck in the front and I wanted cap sleeves I like in the R&H Cinderella that Brandy and Whitney Huston are in. The only problem with this idea is that because it is for a toddler and she has no chest to help hold this up and I knew it would just slowly work its way down. So I added rhinestone straps to keep the dress up where it’s suppose to be. Then I added a mini skirt around the waist line of the leotard (like the ones you see on figure skaters costumes). I wanted a leotard because it would be form fitting instead of so many store bought Cinderella dresses that look like they don’t even fit the child. Also because of her age, it would cover her booty up if she was found in less than lady like poses. Then I made a separate skirt that was big and fluffy. If she had too much trouble walking in it, I could remove it. The little attached skirt on the leotard would hide the elastic waist band. The puffy skirt just consisted of a lot of material (2 layers) gathered at the top with an elastic. I used baby blue sparkle stretch velvet for the leotard top and baby blue sparkle organza for the puff skirt bottom. I used a ton of hot fix crystals just to add alittle something extra. I used a fabric marker to dot everyone where I wanted one and placed them all by hand. I used two sizes 3mm crystals and 4mm crystals. The arm gloves were purchased on ebay. Only place I could find them cheep and small enough. 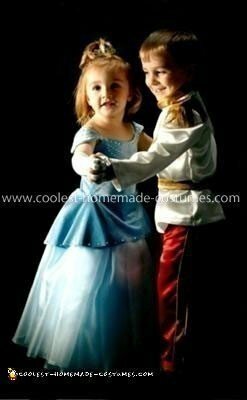 I am looking for a Prince Charming and Cinderella costume for my kids. Would you be interested in selling me a set? 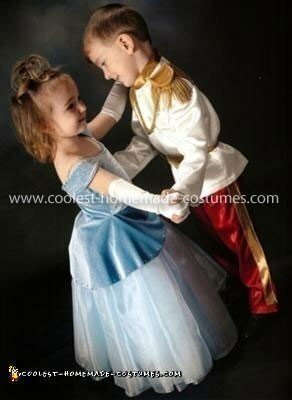 My son’s old Prince Charming costume is on eBay right now from a few years ago. It’s a size 6/7.